Over half of the human body is made of water, and since we lose so much water every day through urine, sweat and even breathing, it's important to replenish our supply daily. Drinking too much water can have disastrous consequences, however. Excessive amounts of water are hard on your kidneys, which can lead to problems with your kidney function or, in extreme cases, even death. Your kidneys play a vital role in keeping your body balanced and healthy. The kidneys filter waste products and excess water out of your blood, which are then expelled in urine. If your kidneys don't function properly, waste products can build up in your blood. Blood requires a certain amount of salt -- at least 0.4 ounces per gallon, explains "Scientific American." If you drink too much water too quickly, the blood becomes diluted and the kidneys cannot filter it fast enough to maintain the proper sodium balance. This condition is called hyponatremia and causes symptoms including fatigue, nausea, vomiting and frequent urination. Seek emergency medical attention if you experience these symptoms after drinking a large volume of liquid. While drinking too much water is hard on your kidneys, one of the biggest dangers is to your brain. Drinking more water than your kidneys can process means that water is soaked up by other cells in your body. Most cells are able to stretch to accommodate the extra water, but brain cells aren't as forgiving because they're packed tightly in your skull along with blood and cerebrospinal fluid, explains Wolfgang Liedtke, a Duke University Medical Center neuroscientist, in an article for "Scientific American." If your brain cells swell with too much water, you may experience seizures, respiratory problems, coma or even death. A common "rule" often discussed when it comes to water consumption is to drink eight 8-ounce glasses of water each day. While some people, such as athletes and those who live in hot climates, may need that much water, most people do not need to drink 64 ounces or more per day, according to Dr. Heinz Valtin, a physician at Dartmouth Medical School, in a 2002 article for "DMS News." While the Food and Nutrition Board of the National Research Council recommends about 1 milliliter of water for each calorie of food, most of that water comes from prepared foods. Valtin also rejects the idea that people are dehydrated by the time they feel thirsty, and suggests thirst is a good regulator of fluid intake. A 2013 study published in the "British Journal of Sports Medicine" offers further support for drinking only when you're thirsty instead of following specific hydration guidelines. The study assessed dehydrated cyclists' performances after they were given either no water, just enough to bring them to 2 percent dehydration or enough water to fully rehydrate them. Researchers administered the water intravenously so the cyclists were unaware of how much, if any, water they received. The study found virtually no difference in performance levels between groups when they participated in a 25-kilometer time trial in the heat and wind. While drinking too much water is rare in healthy adults with full kidney function, those with kidney disease have to be more cautious. Healthy kidneys can process about 15 liters of water a day, which is far more than the average person drinks, according to Columbia University. People with early-stage kidney disease don't usually need to limit their fluids, but those with late-stage kidney disease and patients on dialysis may be put on strict fluid restrictions. Talk with your doctor or dietitian if you have kidney problems, as individual fluid restrictions are highly personalized and based on weight, urine output and other medical factors. Geisel School of Medicine at Dartmouth: "Drink at Least 8 Glasses of Water a Day" -- Really? Columbia Health: Is It Possible to Drink Too Much Water? BBC News: Do You Really Need to Drink Eight Cups of Water a Day? 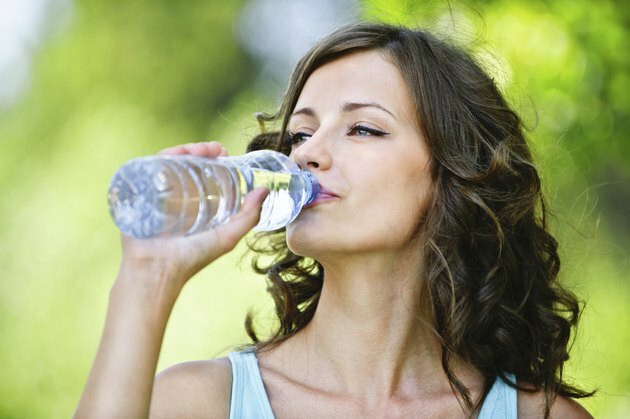 How Much Water Can You Drink Before You Get Sick? How Much Water Can a Human Process Per Hour? How Much Water Do You Drink to Flush Your Body? Is It Okay to Drink Salt Water Every Day As a Cleanser?